With a screen recorder, easily hit ‘record’ and share your video with the world. It’s that easy! Screencasting allows people to create amazing videos without all the hassle. You no longer have to be a video professional to create a screencast. Let’s get down to the basics first. 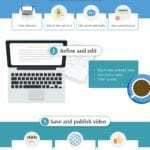 What is a screencast and how can I use it? A screencast is a recording of your screen made into a video. Screencasts are a popular communication tool for multiple industries. Whether you’re an educator, business professional or a gamer, recording your screen is an easy way to communicate, train and sell your ideas. But it can get overwhelming to search online to find the best tools and tips to get started. We’ve devised this simple list to steer you in the right direction, plus we’ve added tips along the way to take your screencasts to the next level. Don’t get into the position where you’re recording, and you start getting bombarded with personal email notifications on your screen. This will all show up on your screencast. So before recording, head into your settings and hide notification reminders while you record. Also, remove any extraneous windows, desktop icons and distracting wallpapers from your screen. While recording, make sure your microphone stays in the same spot throughout your screencast. This will ensure that the volume levels remain the same throughout your recording. While it stays put, make sure you do too. Moving around during your screencast can also change the volume level. One tip is to keep your mouth the same distance from the microphone at all times. Screencasts don’t have to be professional with fancy voiceover artists or quality animations. These are easy videos with a sole purpose of communicating your ideas, message or subject matter. Be yourself and talk conversationally. One tip is to visualize your camera as a person. Imagine talking to a student or business associate about your idea. Communicate with the same inflections and tone of your voice as if they were sitting in front of you. Don’t expect to be perfect the first time you record a video. We know you’ll make mistakes, but by having the ‘pause’ button ready, you’ll be able to take a few breaths, practice what you’re going to say then continue recording. The best thing you can do is to rehearse what you’re going to say. One tip is to deliver your recording in sections, a chunk at a time. This way you can pace yourself and pause, rehearse the next section and then record. The first thing you should do is to watch your video and take mental or physical notes on where to make changes. This will make editing easier for you to follow and also save time in the long run. You can write down the timecode from your editing timeline or make notes for each segment of your video. Some of the things you may want to write down are where you want to add text, images or transitions in your recording. Before adding anything into your video, trim or cut parts of the video you don’t want to use. Trim the beginning and end of your video for any dead space then move on to cutting any pauses or awkward silences throughout your recording. Getting rid of the things you don’t want first will make it easier for you to edit and add to the rest of your video. Your recording went well, but an image on your screen didn’t show up. One way to cover this up is to overlay an image to your video. You can cover up multiple mistakes by adding multimedia including pictures and slides over your recordings. You don’t have to re-record to get this done. All you need to do is import your media and place it in your video to cover up mistakes. You’re almost there! You’re done with step 1 and 2, and now you’re ready to share it with the world! Let’s get your video saved and published so you can start sharing. We always recommend saving your screencast as a video file. It makes it easier to pull up when you want to watch the video from your computer or laptop. Video files in the form of an mp4 are the easiest to view on all devices. You can also upload an mp4 file on multiple social platforms without any hassle. An excellent screencast tool gives you the ability to easily share on social sharing websites like YouTube, Vimeo or Google Drive. Once you connect your social sharing websites with your screencast tool, you can share and publish with just a few clicks. You can only get better from here! Once you share your video to the world, encourage them to provide you with comments and feedback. This will help you become better at creating screencasts. There is also an added benefit to all of this. If you share on sites such as YouTube, getting comments on your videos will help with engagement scores. This means your video may likely show up on searches. 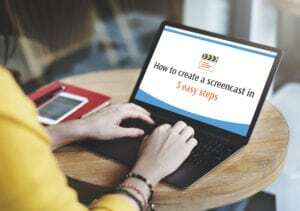 We’ve provided you with three easy steps and all the tips to create an amazing screencast. 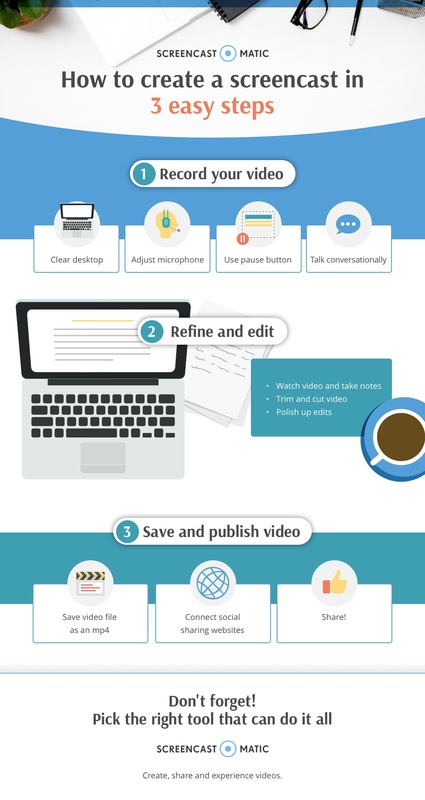 It’s a simple how-to but don’t forget the most important pieces, and it happens before you press ‘record.’ One thing holds true: Preparation is the key to creating a quality screencast. 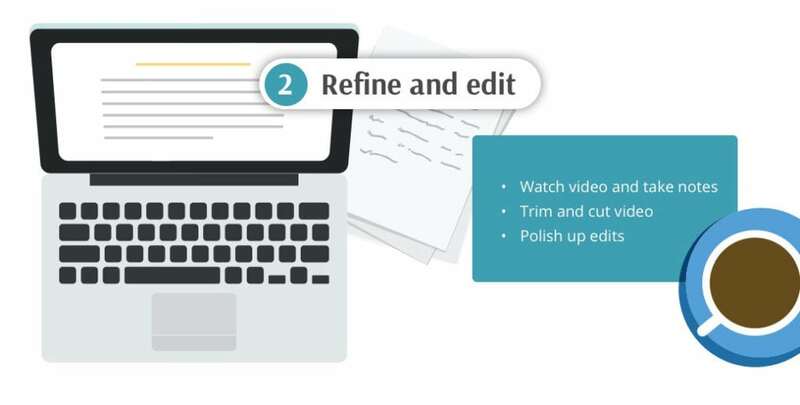 Write an outline or script – Once you’ve picked the right tool, now it’s time to prepare your screencast. This will help you save time and headaches during the creation process. The best thing you can do is to plan it all out with an outline or script. Whether you are creating videos for school or business, scripts are a great way to organize your thoughts. From video tutorials, product demonstrations to social videos, write your thoughts down and have it near your computer or laptop while recording. It will keep you on point throughout your video. Screencast-O-Matic has a beneficial feature called Scripted Recordings, which you can access as a Deluxe user. You can type in your script and record your voice along the way. This helps keep your script organized into sections and gives you the ability to edit over your voice easily. Scripts are great for those looking to create screencasts for video lessons in flipped learning, product promotion for marketing a business or blogging videos for personal endeavors. There are times when scripts may not be needed. For example, lecture capture or recording gaming videos may not need a script and in these cases, just hit record! Check your environment – Make sure you’re in a quiet room and check for any distractions before you begin. Avoid recording in places that reflect noise. For example, bathroom walls bounce noise. Your voice will sound like an echo if you record in a quiet bathroom. Instead, pick a room with carpet and make sure all windows are closed during your recording. Quality audio is crucial when recording a screencast. Second, pick the right tool that works for you. There are numerous tools in the marketplace to get the job done. But instead of getting the job done, why not getting it done RIGHT? That’s where the tool comes in. Picking the right tool for your screencast is key to getting it done RIGHT. Try looking for a screen recorder that’s easy-to-use and intuitive. Not only is it easy, but it also has all the features you need to create amazing screencasts. We recommend Screencast-O-Matic for its screen recording abilities. It comes with a free screen recorder. There’s no need to download and install any applications. Just head to the website, sign up and access the recorder with just a few easy clicks. When you record with Screencast-O-Matic, you can adjust the size of your recording area by choosing from preset sizes, or you can easily drag and drop the frame to get it to your desired size. You also have the option to include your webcam or cursor in your recordings. Choosing audio is also easy with Screencast-O-Matic. You can include computer audio, narration, and music to your videos. Not only is it free to record your screen, but it’s also affordable when you upgrade to a subscription plan. At only $18 a year for a Deluxe plan, you get a complete video editor giving you the ability to add multimedia, transitions and also share your video to multiple social sharing websites. For those who create numerous videos and need hosting services, Screencast-O-Matic has a Premier subscription that gives you the ability to host and manage videos. Remember, you’re going to make mistakes. That’s okay. Hopefully, with these easy steps and tips, you’ll be on your way to creating screencasts with ease!